A WLAN router provides WLANs with their own IP configuration to several WLAN clients via its integrated access point. For this purpose, the WLAN router has a DHCP and DNS server. An alternative for this WLAN access point is a WLAN bridge. Here, the Raspberry Pi serves only as a network bridge for two network segments. On one side the WLAN and on the other side the wired network. A WLAN router provides WLANs with their own IP configuration to several WLAN clients via its integrated access point. For this purpose, the WLAN router has a DHCP and DNS server. An alternative for this WLAN access point is a WLAN bridge. Here, Raspberry Pi serves only as a network bridge for two network segments. On one side the WLAN and on the other side the wired network. Determine which components and prerequisites are necessary for the operation of a WLAN router. Determine the necessary IP configuration. Set up the WLAN access point. Set up the router functions. In Raspbian Jessie, a DHCP Client Daemon (DHCPCD) is enabled by default. The network configuration is done in the file " /etc/dhcpcd.conf ". For a part of the configuration of the network bridge we use the file "/ etc / network / interfaces" here. In this IPv4 configuration, the WLAN interface has a static IPv4 address. We need this for the operation of the DHCP and DNS server. It would also be conceivable to give the Ethernet interface a static IP configuration. This need not be. In this form, the WLAN router has the advantage that it works in any local area network when the IPv4 configuration is delivered via DHCP to the Ethernet interface. If IPv6 is enabled then it works as well. Now check whether the "dhcpcd" is active. If so, we add the following line to its configuration. Both network interfaces (eth0 and wlan0) must be present and have an IPv4 configuration. Next, we set up the DHCP server and DNS cache. The DHCP server ensures that the WLAN clients receive all necessary information for the IP configuration after logging on. The DNS service takes over the name resolution. Both take care of "dnsmasq". After that we have to configure "dnsmasq". To do this, we open the file "/etc/dnsmasq.conf". If you want, then you can log on to the WLAN AP again with a wireless client and check if you got an IPv4 configuration. Then we install the host access point daemon, "hostapd" for short. This is a WLAN authenticator. He takes care of offering encrypted WLAN functions and the required authentication of the WLAN clients. After the installation, we set up "hostapd", which operates the WLAN access point for the router. Three settings have to be made individually. These are the WLAN name ("ssid"), the channel ("channel"), which can be freely configured from 1 to 13, but you do not have to change anything here. You may have to change the channel here, if a WLAN analysis shows that already several other WLANs occupy this channel. In principle, several WLANs can occupy the same channel. This is better than when the channels overlap. Before we start setting up the WLAN router, we first put the WLAN host into operation. Only if that works, worth the further steps. If the WLAN host does not work, you do not even need to set up the router functions. To start up the WLAN host, we start "hostapd" in debug mode. We will see "all" error messages. Note: With "Ctrl + C" you can stop the running hostapd instance if necessary. This is a good opportunity to test the WLAN AP. For this one tries with a WLAN client to find the WLAN and log in there. In the command line, you can observe how the WLAN client logs in (AP-STA-CONNECTED) and also logs it out again (AP-STA-DISCONNECTED) when it ends the connection to the WLAN. Note: If you make the configuration via SSH, then you should make the testing of the wireless AP with another client, otherwise you shoot yourself by changing the wireless network, the SSH connection. If "hostapd" aborts with error messages and returns to command input, then something is wrong. However, the errors are extremely diverse and the associated error messages are not always clear. A popular error is the missing "sudo" when calling "hostapd". Another source of error is the distribution used. It will work in any case with the original Raspbian. For the "hostapd" to start as a daemon in the background, you have to tell the daemon where to find its configuration. The "hostapd" is then put into operation with the following command. The status of the daemon can be checked with the following command. Up to this point, one has in the best case a connection to the WLAN and an IPv4 configuration received. What does not work yet is a connection to the internet. That's what we care about now. For this we supplement the network settings. NAT, masquerading and IP forwarding are activated here. Both are important router functions. Then the services "hostapd" and "dnsmasq" are restarted. Then you have to save and close the file: Ctrl + O, Return, Ctrl + X. A restart of Raspberry Pi is finally required. If Raspberry Pi is restarted, you should check whether the services "hostapd" and "dnsmasq" run before you log on to the newly established wireless router. If the services are running and the processes for the two services are displayed, then you can try to log in to the WLAN router with a WLAN client and set up an Internet connection. 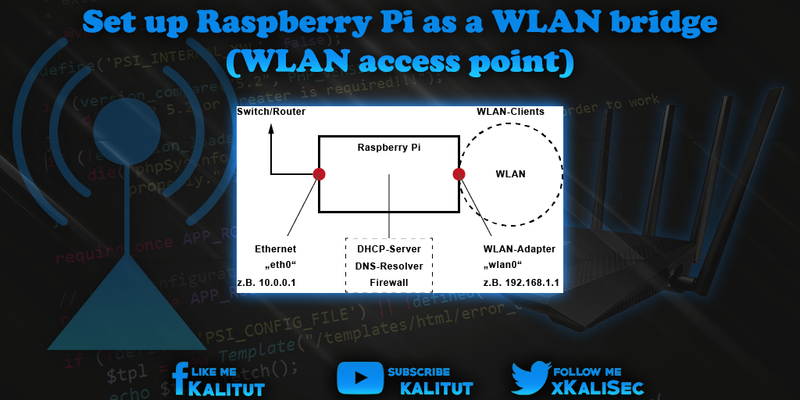 No matter which solution, as a WLAN access point, Raspberry Pi is not suitable for its interface performance. The facility is error prone, cumbersome and may not be safe. Apart from that, the Raspberry Pi with the necessary equipment is more expensive than a wireless router. If you seriously and permanently want to operate a wireless access point, you should take a look at OpenWRT and get a cheap compatible router to do so. Price, but also from the comfort is much more interesting. Anyone who sets up and starts up their own network components also takes responsibility for this. With this solution, you can possibly shoot yourself in the knee. If you think that the solution presented here is finished, then that is a mistake. If you do not take any extra security measures, then you break yourself with this wireless router a security hole in the local network.